When the trees get older, they start to decay and slowly release the stored carbon. The forest succumbs to wildfire, insects or disease and releases the carbon quickly. The trees are harvested and manufactured into products, which continue to store much of the carbon. (Wood material is approximately 50 percent carbon by dry weight.) 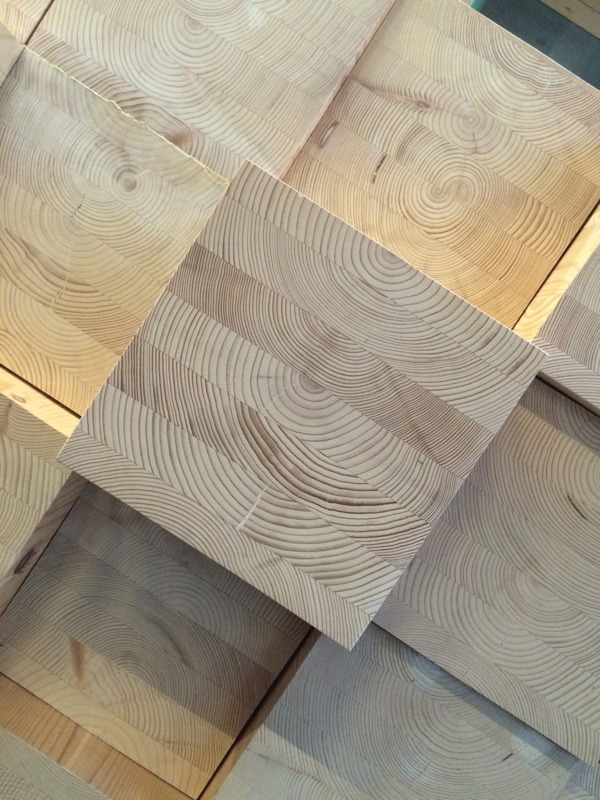 In the case of wood buildings, the carbon is kept out of the atmosphere for the lifetime of the structure—or longer if the wood is reclaimed at the end of the building’s service life and reused or manufactured into other products. Unless the land is converted to another use, the cycle begins again as the forest regenerates and young seedlings once again begin absorbing CO2. For more information, the USDA Forest Service recently released an infographic illustrating the forest/carbon cycle (www.fs.fed.us/climatechange/advisor/scorecard/Carbon_Infographic_Final.pdf). The impact of materials from extraction or harvesting through manufacturing, transportation and construction are considered initial embodied impacts. They are distinct from operational impacts, which result from a building’s operation and from recurring embodied impacts, which relate to the durability of building materials, components and systems; how well they’re maintained; and the service life of the building. Building materials tend to have the greatest impact from extraction through manufacturing. Within an LCA, this is also where wood’s advantages are most evident. Wood products store carbon. In the case of wood buildings, the carbon is kept out of the atmosphere for the lifetime of the structure—or longer if the wood is reclaimed and reused or manufactured into other products. In the context of comparing one building design with another, it is also useful to consider the environmental impacts of the applicable recycling process. 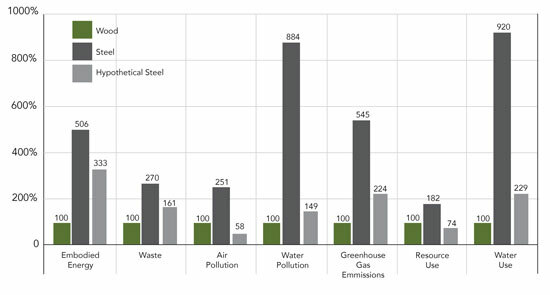 For example, recycling scrap steel requires approximately half the energy as refining virgin steel from iron ore, yet this is still considerably more energy than is required to manufacture wood products.21, 22 Expanding this point to other impact categories, the chart above compares the LCA profile of two standard structural post-and-beam systems, and one hypothetical steel system with 100 percent recycled content. Wood is shown to be superior to virgin steel in all categories and to the hypothetical 100 percent recycled steel in all categories except air pollution and resource use.